Media Player in Windows has been able to play the popular video files like AVI, MP4, MPEG and others. However, some video type such as MKV, FLV (YouTube video), 3GP (from mobile phone) can not be played without a correct codec. Or you may find MP4 (H.264) video that only play voice but the video does not show up (as well as many file extensions like rmvb, xvid, ogg, FLAC WebM or audio files, ogg, mod, ALAC). To play that video in Windows so we can watch it is by installing a video codec called shark007. 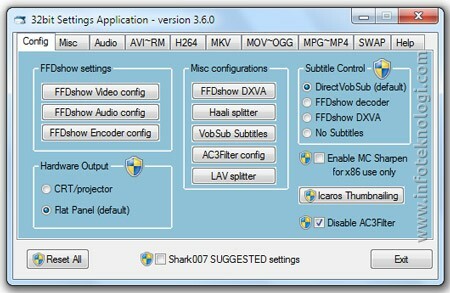 There are also other alternatives to play video file such as K-Lite, but Info Technology prefer shark007 because it is easy to install and configure. A. Download shark007 from the following link and select the OS: XP / Vista , Windows 7 or Windows 8. 3. Check the box marked "shark007 Suggested Settings" (recommended). 4. You can also change the settings manually codec used for each type of multimedia file. Don't forget to click the tab Help -> Windows Filetype Associations when the setting is done manually.